“Contract killer” is a fitting job for a vampire, and it suits Liam just fine. Cast down from the wealth and status of the Sky for taking a human lover, Liam lurks in the poor and pollution-choked Gutter, killing to survive. Between his natural strengths and his Cybernetix mods, no mark has ever escaped him.Liam’s ex-lover Daniel is the heir to Cybernetix—and its greatest threat. Horrified by people less man than machine and the exploitation of Gutter factory workers, he’d rather destroy Cybernetix than inherit it . . . if his father doesn’t destroy him first.Years of anger and a heap of mods have kept Daniel and Liam apart. 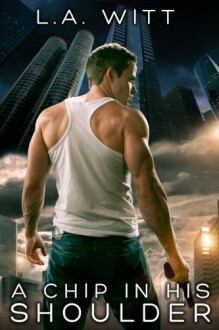 When Liam is hired to slaughter a man in his glass Sky tower, he walks right into a Daniel-shaped trap. Daniel’s father has betrayed them both, and only by working together can Daniel and Liam survive the coming day. They have no reason to trust each other, but as the dawn looms, a bargain that began with the simple urge to live soon reminds them of the love they once shared. Can they find each other again, or will the Cybernetix assassins find them first? Fun.Fast.Hot.Flawed. Interesting world but it left me with so many questions about the making of their history. Humans, Vampire how did that come about?One book chopped in two.Did I say fun? Sometimes you just need to go with the flow. Buy Lube!